Last week we looked at the common signs of anxiety in children. The underlying reasons behind anxiety and the way it is expressed is varied and complex. If you’re in a doubt, see a child play therapist to get advice on your child’s specific circumstances and get the support you need as a family. There are ways to support your child at home whilst they are undergoing play therapy. These tips are also handy if your child is having a stressful time at the moment and you want to prevent them getting “stuck” in their fright, fight or freeze response. 1. Observe your child….out loud! By tracking their responses you are first of all helping them feel “seen” and important. They have your attention. Secondly they are gaining self awareness. They can hear themselves back, they can notice what their body is doing for the first time perhaps? Thirdly, they feel understood. Can you remember a time when you felt understood by another? That someone who just gets it? What a relief that brings. This leads to the most important impact in my mind. The child doesn’t feel alone. When faced with a big bear would you rather tackle it on your own or with another? One of the most distressing things about having anxiety is the feeling that you are all alone stuck with these bodily sensations that you don’t understand or know how to control and there’s often this deep fear that there is something deeply wrong with you. Someone standing alongside you, you gets it, who sees you, who doesn’t try and rescue you but who waits, who is calm. Being with that person takes the edge of the intense feelings going on. Their presence makes it seem that you might just be able to handle this. Give this gift to your child in their scary moments. You can see your child’s getting another wave of anxiety. Their eyes widen, their shoulders tense up, their jaw clenches and they make little fists. Or maybe it looks like they’re about to run! Stop and observe them (outloud again!) and then ask them where they feel something in their body. If they say they feel something in their chest ask them what colour they would give that feeling (or if appropriate what describing word). “What’s its name?” is a good prompt along with what name should we call it? Depending on the age you may give some suggestions such as “Mr fizzles” “Ms flutterpompom”. Keep repeating the name when the sensations come up. “Seem like Mr Fizzles is back in your tummy again. Mr Fizzles! Stop fizzing in there!”. It’s more empowering if the child themselves can talk to the anxiety “Mr Fizzles” and give him a telling off! Making the feelings and sensations associated with anxiety more concrete helps children better understand what’s going on and create a bit of psychological distance. Panic attacks escalate when there is an intense fear and confusion of the intense sensations going on in the body. A silly name can take the fear out of the moment. Even better if it is a super silly name that creates a bit of a laugh (that releases stress in the body). Having the dialogue and the back and forth with the more tangible real sensation also works magic in that it keeps the child present in the moment rather than worrying about the future and all that could go wrong. A full breath in should fill your lungs all the way down so that your diaphragm extends causing your tummy to pop out. Yoga teachers and therapists alike often call this belly breathing. All too often we only breath into our chests creating a shallow rapid breath. This is the kind of breathing we need for quick action and stress responses. To fully replenish our bodies with fresh oxygen we need deeper fully inhalations. Sit up straight and put your hands on your own tummy. Breath slowly and deeply in through your nose until your hands are pushed out by your belly. Then feel how your tummy flattens as you exhale. Once you’ve got the hang of this (adults can often be stressed and out of practice with this one!) invite your child to put their hands (or their head!) on your tummy and see what belly breathing looks like. Then you can both lie on the floor. Place a teddy bear or any large toy you like on your tummies and practice breathing slowly lifting the toy up and down with your belly breathing. This can be a good routine before bedtime as well for use in the moment of stress and anxiety during the day. Breathing is one of the few bodily processes that is under our non-conscious AND conscious control. It’s a powerful switch that can flick our nervous systems into a calmer state of being. This is why it is ideal to do this practice as part of a bedtime routine. Belly breathing sends messages to your brain and body to relax and rest. Equally when your child is in a fight or flight moment they can easily place their hand on their tummy to calm their nervous system. Taking deeper breathes means the brain receives more oxygenated blood supply allowing the child to better access their problem solving skills. 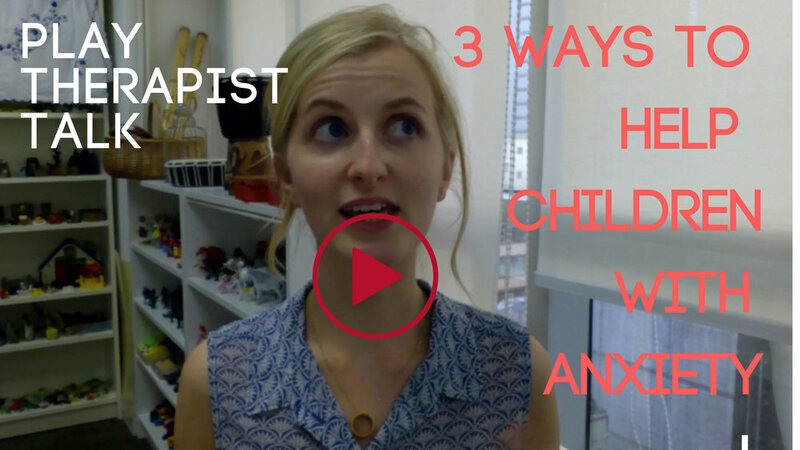 Handling anxiety in your child is a tough job for any parent to do. Make sure you get good care and support for yourself and your child. These are powerful simple tools to try but they’re not always easy to do on your own. I aim to write about more tools to help anxiety in the future because there are so many! Try these first and let me know how it goes. Please do share in the comments which activity worked for you or share your own tips or tricks. Your comment could help another person who’s reading this. Comment below!